Does Condo Living Suit Your Lifestyle? The condominiums at Wanaque Reserve in New Jersey offer maintenance-free living and privacy. Living in an apartment-style condo may not be the best fit for every retiree, but for many it may be an ideal setting for an active adult lifestyle. Condos typically provide low-maintenance, single-level living in locations that are often close to more urban attractions. Yet, there are some potential downsides, such as higher monthly HOA fees and noisy neighbors. Condominium properties can actually come in many forms, including townhomes or single-family homes, as the legal designation simply means that you do not own the land or certain exterior elements. However, when most people talk about condos they are referring to apartment-style living. This can be garden-style condos with just two or three levels, mid-rise buildings or high-rise structures. 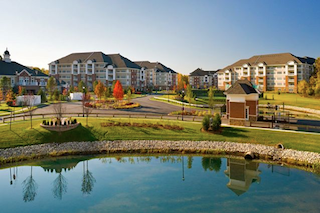 Active adults living in the suburbs may be more used to single-family homes or townhomes, but condos often show up as part of planned communities or closer to town centers. Condos are also more common options for living in an urban environment or near the beach in a resort area. This makes them an ideal choice for those who want to live in the heart of a more urban, walkable area. Condominiums typically offer single-level floor plans, although some units are designed with loft spaces or full second floors. This is particularly seen in penthouse condos, but multiple storied units are sometimes available on lower floors as well. Many active adults prefer the main-level living that is common to condos, especially when it comes with great, high-level views. Those who prefer apartment-style living often cite their many conveniences. Secure door systems, a concierge desk or even a doorman may be available to screen visitors. Trash is whisked away through a nearby chute without having to wheel it out to a curb on a specified day. Exterior maintenance, landscaping and lawn services are handled by the management, and buildings with underground garages keep residents' cars out of the elements. Condo residents may also have access to in-building amenities, such as fitness centers, social areas, game rooms or convenience stores. Buildings may also provide outdoor features such as swimming pools, roof-top terraces, barbecue patios or picnic areas. Mid-rise or high-rise condos usually offer elevators as well, making it easy to bring home groceries and other packages. There are also reasons why some active adults may not like condo living. Some worry about neighbors who may smoke, make a lot of noise or be otherwise disruptive. They may also prefer a detached home where they don't have to worry about being the one who is loud or disruptive for others. Condos may also have limitations on pets, such as only allowing dogs under a certain size or even banning non-caged pets altogether. Because common area maintenance and other services are included, monthly homeowners' association fees tend to be higher for condos. The fees also go up more if the building includes additional amenities. Condos in popular urban or resort areas often tend to be more expensive, which means they may cost as much as, or more than, a single-family home in a suburban neighborhood. There is a lot to consider when choosing between a condo, townhome or single-family home. Weighing the pros and cons is a personal matter, and often homebuyers are best advised to stick with the home style that feels more comfortable for them. What are your thoughts? Do you prefer living in a condo, a townhouse or a single-family home?